The day we got this wedding enquiry I knew they were going to be a fantastic couple to work with. 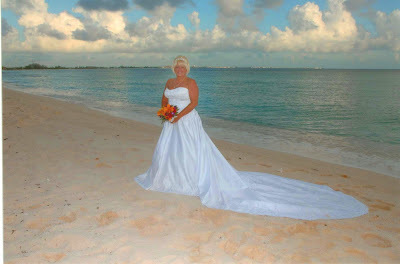 Jan was just the kind of "encore" bride I love to work with, full of life and fun. 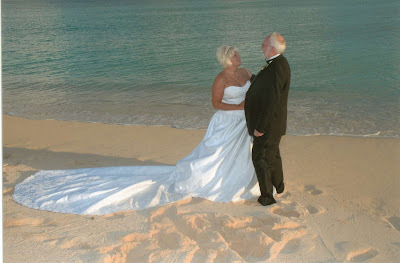 I loved her e-bay wedding gown and the story of how she got it! 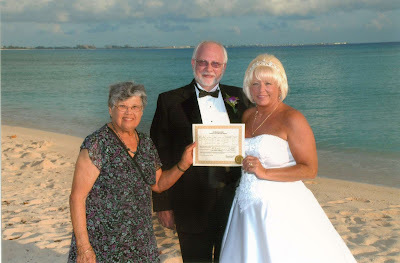 Fortunately I got to meet them both when they came in to do the documentation for their Special Marriage License. Robert knows he's a lucky man! Jan adores her Scotsman, and it is very obvious! 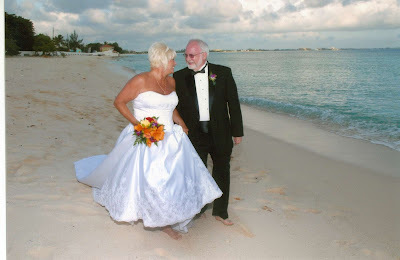 Here they are barefoot on Seven Mile Beach. the "woman with the 10 ft train". 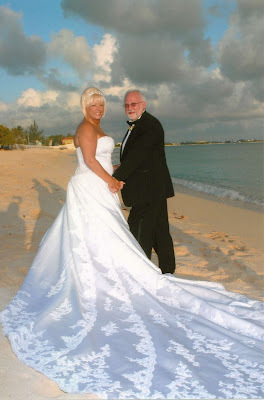 Pictures by Marcus Montana, planning and ceremony by Cayman Weddings. I wished I could have been here too, but I was off on another wedding assignment. 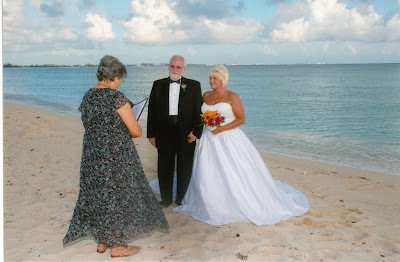 Here is Francine, Cayman's wedding doyenne extraordinare doing what she does best, making people happy. With the Marriage Certificate, and the happy couple. A quote from Jan- "Robert and I had so much fun meeting you and your family. Thank you for everything!! It was the best day ever, nothing could of made it better."